Your four-legged friends are now free to roam off-leash at a number of parks around the Logan area. 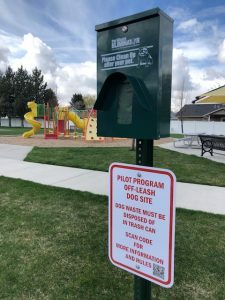 Logan City recently passed a one-year pilot program to allow dogs in certain city parks. City leaders and volunteers spent the last month cleaning up the parks and installing equipment in preparation for the program, which officially begins April 15. Russ Akina, Parks and Recreation Manager for Logan City, said he hopes the program is a success. What about on-leash parks for dogs? I’m afraid the other dogs will attack my dog on the leash. Well, ya just ruined it for the humans who want a summer nap under a shade tree! Who in the world passed this ridiculous “pilot”. So now I need to leave the park to give space to dogs? I’m terrified with big dogs coming next to me or my kids.., also I worry to have a big dog coming towards our little dog. This is totally irrelevant. If people want their dog leash free go to a dog park!! If I started a proposition to require certified training for any breed who has attacked (more than a simple bite) a human in the last decade in cache valley. How many people do you think would support/help the project?